WSDOT capital projects are facing many of the same budget increases as SDOT and ST.
It’s been 50 years since Seattle’s Freeway Revolt. Time to get the band back together? Light rail stations and Whole Foods lead to apartments? Let’s see how that works out at Bellevue’s new Whole Foods light rail station (er, sorry, “Hospital Station”). Bellevue is currently working on the Wilberton rezone (Which is the area on the East side of 405) with areas zoned up to 450′. The spring district will have of 5000 units when done, and practically all new construction in Bellevue and Redmond is located within the walk shed of the planned light rail station. If the Wilburton rezone is within the walkshed of Hospital Station, then isn’t 1st Ave in dt Seattle within the walkshed of the transit on 2nd, 3rd and 4th Ave? And Mark Dublin, I have a Page 2 assignment for you. You are to write a post about all the future light rail stations … Northgate, Hospital, Mercer Island, etc., and quickly evaluate each one. Either by giving them a letter grade, or a short pros and cons blurb. Your call. I was on the committee for the Wilburton rezone. My comment above wasn’t meant to doubt that we’ll see new development there, I’m just curious how much of it will be apartments. My money says there will be less residential and more commercial next to the light rail station. Yeah, that Whole Foods is definitely not going to remain just a whole foods for the long term. And hey, the hospital across the street has already broken ground on a major expansion. Two words: Beacon Hill Red Apple. If a tiny grocery chain store adjacent to a Link Station can stay one story for 10 years and counting, don’t you think a store owned by the richest man on earth can, as well? Sure, everything around it will grow, but that WF will be Bellevue’s own “Up” house. How much commercial can fit in a several-story building? Or is the problem that the zoning still doesn’t allow for a several-story building? >A few residents in the Norton Grand area made a last-minute plea to further lower building heights in areas adjacent to their historic neighborhood. Opponents of the upzones in these areas said the tall buildings would create an overshadowing canyon effect on the old homes. 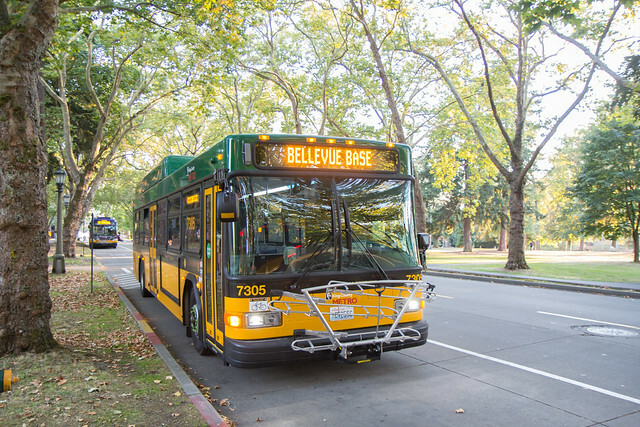 Can the Lime scooters be taken on the 594 bus? I’m visiting Portland and was asked while purchasing something if I needed my parking validated. I said no, I took the light rail here. The shops only subsidize driving, I guess. Overall I’m very surprised how car-centric Portland is. Time and again in Seattle during job interviews they offer to reimburse me for parking but never have a system in place to pay me for the bus fare I paid to get to the interview. My question: Does anyone know of any cities that have a system or culture to ‘validate’ your transit pass in situations like this? Only place I can readily think of in Portland is the zoo. You pay to park there but can get a discount if you show a transit ticket. In Seattle DT, it’s the same thing. Part of the problem is that Orca users have no paper proof of payment suitable for validation. Many companies do do the equivalent for their employees, though, by providing them free transit passes. And when traveling on business, it is usually possible to charge light rail tickets to a company credit card, just like you would a Lyft ride. I expensed a trip on a Bird scooter in San Jose a few months ago, as my ride from the airport to the company’s office. It was approved with no problems. In Los Angeles, you can get discounts at participating businesses, museums and events by showing your transit card. I don’t know if they still do it but if you get a jury summons from King County, a bus ticket was included for traveling to court on the first day. Now for King County, they just add the cost of a bus ride to your per diem and mail you a check. Multnomah County does the added transit cost to the per diem compensation as well. Here, it’s a day ticket they pay you for ($5 per day). However, Multnomah County also tries to guilt trip you into donating the money back into the system as that is the money they use for making improvements to the jury room. The last time I had jury duty around 2008, two bus tickets were included in the summons as tear-off strips. then on the first day you asked for compensation for the remaining days and they included it in your check. I never used these because I have a monthly pass. Way, way back when, the Downtown Seattle Assn members would provide “Easy Streets” token that were good for a free bus ride or a buck toward parking at certain lots. Huh? I can see the kids lobbying their transit officials, but I don’t see the specific connection. Did the kids paint “bus only” in the street and the city was just cool with it? Reductress is a hyper-satirical parody site in the vein of the Onion, but with a more explicitly feminist bent (often skewering performative and problematic feminist actions and practices along the way). Thanks for explaining. Though I remain bewildered why STB included the link in the middle of actual news stories. Levity. It’s not a bad thing to have every once in a while. And these days a lot of people use it as a coping mechanism. @Larry every so often a story appears on news/social media about a low-paid worker with an awful commute—usually walking or cycling an extreme distance on terrible infrastructure—and some Good Samaritan(s) (boss, coworkers, church, etc.) steps in to buy them a car. It’s always left unsaid a) how that person will afford to fuel, insure, and maintain that car on their income, b) how many other people are in the same situation and don’t have some angel to intervene on their behalf, and c) whether maybe our public policy could not put people in that situation in the first place. I thought this was a pretty good send-up. Question I’d ask to check the seriousness of the students’ plan is: Do the purple lines and dots indicate that trains turn at Art Museum stop at Woodward and Boren? Or has that line been re-directed all the way down to Cobo Hal on the waterfront.? And most of all, shouldn’t the giant orange and chartreuse station dot completely cover up Greektown as the stadium does in real life? Or, as I really suspect, are the students really in a covert engineering program – I think there’s still a mining school in the Upper Penninsula- so by the time they graduate, they’ll have all our tunnels already dug. Defense Department covert funding under top secret rail to Russia with trainloads of freshly laundered money. So first inquiry of year 2075 will discover station by statio,n that there’s already a tunnel between two stations, ‘way below budget already waiting to be finished. And with each new discovery of another segment of history’s least expensive subway, whole legislature will be showering WSDOT and SDOT with money in return for naming rights. So here’s where you come in, Sam. In recognition of fact that so much elevated rail has now been created that huge flocks of pigeons have unfortunately ended up with same restroom contractor as Tukwila International, Sea-Tac, Angle Lake and all the way ’til they go classic Interurban and trail into the Yellow Line in Portland. Chicago had, I think, about six peanut machines per elevated stations. So a whole newly restored prehistoric breed of pigeons with hearing that can sense the click of a nickel from Lynnwood to Portland. Creating a new terror, not price of peanuts, but giant broodling pterocactysl whose war god is whoever invented smart phones. And we’ll give every station an artistic 19th Century brass cage. And you’ll be supplied with trainloads of newspaper, all from the Seattle Times, and every LINK train with a gondola segment. Coal, not streetcar deniers. And you get your choice of shovels, Gothic barn-plaza or WWI memorial entrenching tool. There’s a little round gear-handle so you can unfold it flat on your face under a flock of enemy close air support with a peanut in their every beak. Payment? No sweat. Your new car-tabs are in the mail, with special surprise from the Legislature. Call Bob Hasegawa about it, and maybe Tim Eyman will send you a pet pigeon. Go away, Sam. Now if someone would just work on the Interurban Trail between 200th / Aurora Village Transit Center north to 242nd. Kent story. Cancel the garage. At $65m and 500 spaces or 1,000 daily riders, many more riders could be attracted if the funds were used to buy local service from Metro. The land would be better used for housing; how about five stories of wood frame atop two levels of concrete? the housing would generate riders as well. the ST access policy says they should consider cost-effectiveness. Why does Kent want an additional huge garage downtown generating more peak period traffic? we need to shift the housing supply curve out more than build garages. Do you want the commuters who would have parked in those spaces, then taken public transit most of the way into work to drive the whole way instead? At that price, yes. Don’t you care about government waste? Sure. Let’s see how long they last in our current traffic. Many would be enticed after a few months or a few years to take that local bus that we could have paid for with the cost of the garage or to make alternative arrangements like changing jobs, working from home, or moving, potentially to a smaller home or a home with no lawn closer to transit. Sure, some would keep commuting by car, and those are generally not the people taking the Sounder train. FWIW, our local Sounder shuttle moves at exactly the same speed as traffic, so it is no different than driving to the train station. No hunting for parking or getting your door dinged, and no walking up and down the stairs of the garage. That kind of local bus service is attractive to most commuters. The NYC intersection safety treatments is pretty interesting! There are places in Seattle where drivers easily cut corners and pedestrians could benefit from this. Of course, Seattle has so many intersections where basic road paint is not maintained —or not installed in the first place. Let’s not even begin to discuss that half of our all-way stops say that they are with a sign under the stop sign — and half don’t. Overlooking basic paint and sign problems yet shouting for Vision Zero safety measures from the rafters makes SDOT look pretty hypocritical. Thanks for including the two links to the herald.net pieces. It’s always nice to see some Snohomish County bits in the news roundup posts. Regarding the “missing link” completion of the Interurban Trail section thru Lynnwood, I thought I’d add a little context that was left out of the article. As the piece mentioned, the city was able to do this project thanks to a grant from the Verdant Health Commission. The commission in question here is a dba for the Snohomish County Public Hospital District No. 2, which is directed by a publicly elected board of commissioners. Its financing comes from essentially two sources, lease revenue from the property and facilities now operated by Swedish Health Services at Swedish Edmonds (formerly Stevens Hospital), as well as a few other properties, and property taxes collected from property owners within the district (such as myself). Overall the district is in a rather good financial position at present and there doesn’t seem to be a lot of pushback from taxpayers regarding its grant recipients, like Bike2Health in this case. It’s also written by our former reporter, Lizz Giordano. Yup. I miss her reporting here, but STB’s loss has been The Herald’s gain. Yay! Hey guess what? 3Rd ave is stil an effing nightmare on the bus. Another stellar rollout by Metro! Seem to recall I finished last night’s comment with a threat to get myself [AH]’d all the way to Tierra Del Fuego LINK’s last stop because everybody who thought Jenny Durkan was lying had mistaken her for SDOT. Now, all packed, with my card headed for its last tap, so as to be ready for our next order of business. Whoever in SDOT is lying like a moth -eaten bear rug, the Mayor won’t give a polygraphic quiver about paving our transit lanes with red ferrari roofs. Whatever the whole world gives a crap about knowing, doesn’t anybody from Rainier Beach to the Shoreline Line object to spending PM rush in their back seat, doing what our parents thought we were doing when in fact we were only betting we could reach the steering wheel with our feet? Real draw of driverless cars but you didn’t hear that from me ’cause girls thought transit riders were, you know, their weird uncle from Flatbush. Unless I missed something as usual, what are we going to do about this automobilitary coup? Can Jenny do this on her own authority? She doesn’t even have an Olympic golden marmot on her head! Where in the name of Frank Sprague is there any emphatic objection? Bear with me, because remember, I still don’t know if the C-line is City of Seattle or Metro… can’t the City Council do anything about this? Because I’m serious about those six year old anarchists from Olympia. That’s Seattle’s mayor all over. She didn’t lie to the Detention Center about that one either. So isn’t there one Public Defender whose income entitles them to same ORCA card as mine that can work a No-Class action lawsuit? What we need is the much underused WRIT OF DIVISTIQUE PER MEMBRA BOVEM STERCORE! Go to Google Latin-English. Really works! I hope one day the biggest missing links for the interurban trail… Martha Lake area and the county line get fixed. Both will probably be quite expensive to fix though. I’m not going to lie and say I don’t miss a lot of things. OK, just about everything. But why are definite plans to make Seattle transit into a long set of woonerfs (either Dutch or misspelling of Woonerves) creates so little interest. Even if, hopefully, author is in SDOT and therefore lying. Also would appreciate any information about any serious organized political efforts to re-insert public transit anywhere at all in the plan. Couple e-mail addresses will do it. Somebody has to. Sound Transit finally baselined the Federal Way Link Extension project today during their monthly full board meeting. Adopts the Federal Way Link Extension baseline schedule and budget by (a) increasing the authorized project allocation to date by $2,038,910,000 from $412,625,000 to $2,451,535,000 (b) lowering the 2018 annual budget by $52,612,337 from $116,533,002 to $63,920,665; and (c) establishing a project revenue service date of December 31, 2024.
demolition work is currently underway. provide agency administration, design, acquisition of right-of-way, construction, construction services, and third-party activities. • This action establishes the project revenue service date as December 31, 2024.
comparison, the proposed baseline budget is $2.5 billion or $460.3 million higher than the ST2/ST3 estimate. I thought that the commingling of ST2 and ST3 was strategically smart for this. It’s too bad that ST3 didn’t have a similar strategy for Lynnwood Link in ST3. Can ST3 funds from Snohomish backfill the escalated Lynnwood Link costs, too? I also have to wonder if there is a ripple effect that may tank the Link connection to Tacoma. Of course, I believe that that extension comes from two subarea pots (not just South King) so the “line” between the subarea proportions is also blurred. I wouldn’t give ST that much credit frankly. The comingling of ST2/ST3 funding was simply the reality that the agency was dealing with when it delayed the ST2 project during its 2010 (I think that was the year) “realignment” of ST2 deliverables. As far as the FFGA is concerned, the FTA doesn’t really care how the local funding portion came about, rather just that the committment is indeed in place. In regard to the Lynnwood Link project, I suspect that the agency was aware of the significant cost escalation of the project before the ST3 vote and made a political decision to keep it under wraps until early 2017. Putting something in the ST3 plan to cover the increased costs for Lynnwood Link would’ve required the agency to disclose the known issues, which could have been politically disastrous. I’m not entirely sure what you mean by this. In the past, prior to the passage of ST3, ST did a decent job of segregating Sound Move versus ST2 funding/expenditures in their reporting. I’m not so sure that’s still true now with a third layer of taxation in the mix. Clearly the agency has the ability to do so in its project and subarea accounting, as it knows the components from each ballot measure and thus can determine the proportionate contribution. So, are you asking whether ST can use the additional .8% in MVET, the additional .5% in sales taxes and $.25/$1,000 in property taxes to fund the higher costs for Lynnwood Link? I don’t believe ST is prohibited in any way from shifting these additional tax collections to complete prior ballot measure projects, still adhering to the agency’s subarea equity guidelines in the process. It simply changes ST’s financial plan, which of course has an impact on its statutory debt limits. Rogoff has maintained that even with the higher costs for Lynnwood Link, and perhaps even with the FFGA not coming into fruition, that the agency has the capacity to complete the project, albeit perhaps with a slightly longer timeline. Since this particular project is so highly leveraged with regard to federal funding, that may be a rose-colored glasses type of perspective and/or just more political posturing. This is also true for Lynnwood Link as this project also involves two subarea pots. One final note. ST has not been fully transparent with regard to the cost overruns on both the Lynnwood Link and Federal Way Link projects in an additional way. One needs to keep in mind that the original estimates for these projects included the proportional costs for the needed fleet expansion and operation and maintenance facilities. The baselined project budgets do not include these costs as ST has created separate projects/budgets for these additional elements. The resolution passed earlier this year wherein the Lynnwood Link project budget was baselined explained this much more fully, and thus I would recommend reading THAT resolution in its entirety. All of the indicators are that ST3 project costs were significantly under-budgeted in 2016. ST also did not write in enough in contingencies, which we’ve discussed several times before. It was apparent at the time that most of the Board was obsessed with making promises to keep interested parties happy and optimistic about the future plan. There must have been some strong pressure to not deliver any cost “bad news”. Anyway, I think the only way for ST3 Link to fully happen will be to get another funding measure approved. Of course, the more obscure the project, the harder a vote will be — and there are few general areas outside of First Hill that the region will want to fund as a high priority. Further, additional funding will also be needed to improve the core system — which is less attractive for a general voter. The real rub will be the terribly unfounded second Downtown Seattle tunnel — and every subarea is on the hook to pay for that. I predict that the rosy Link planning going on right now will give way to a darker future in about 6 years unless a new funding approach emerges. Lol. I guess that’s ONE way of putting it. I concur with your overall perspective, though I don’t know if it’ll take all of six years to see such a “darker future”, especially if we start to see the beginnings of an economic recession. Thanks for the reply. I don’t see how you can’t comingle Federal Way in any sane way. ST2 was originally defined to 272nd, then truncated to 200th in the recession, then re-extended to 240th targeted to 2023 plus planning through 320th. ST3postponed the date to 2024 and added Federal Way. We know that ST can’t build a one- or two-station extension in one year, so it clearly will start earlier. It’s fuzzy whether 272nd should be considered as belonging to to ST3 or ST2 because it was originally part of ST2. (There’s a similar fuzziness with U-District station, which was originally part of ST1, but it turned out the budget wasn’t large enough for it.) So Federal Way is intrinsically “comingled” and it’s doubtful whether you can logically unentangle it. The voter’s mandate in ST3 was “Federal Way and Tacoma, forget about the previous phases.” So I don’t see why we can’t forget about the previous phases. Tacoma is one of the most certain extensions because Pierce has been saving up for it since ST1. That’s why Tacoma Link was free, because Pierce had money to burn and nothing to spend it on. (I think the city of Tacoma started paying your fare a couple years ago.) It depends only on Federal Way, but Federal Way is very inexpensive because it’s one or two stations elevated along a freeway so it’s certain to be done. So I think Tacoma is pretty certain. the most uncertain ones in my mind are West Seattle because of river and hill challenges, Everett because of the expensive Paine Field extension, and Issaquah which might get canceled by voters in the 2030s when they think more about its potential boondogglehood (a train with few riders). Can ST3 funds from Snohomish backfill the escalated Lynnwood Link costs, too? I think it is expected. I also think it is the right thing to do. You really have diminishing returns for Everett Link. You could even argue that is the case after 145th (but that would only be if there was a good way to get from the I-5 express lanes over to the station). But with Lynnwood, that is certainly the case. Folks in Everett get a lot out of a station in Lynnwood. I’m sure there are a few who are actually just headed to Lynnwood (or vice versa). But mainly you create a nice interface for express buses. You avoid the freeway mess around Northgate that will likely occur for a few years, and it is much better for buses than slogging to downtown. This makes Lynnwood a very important improvement for Everett as well as every place in the region that wants rail to be extended north of Lynnwood. Thus it is an appropriate, if disappointing use of the money. I complained about deception with ST3 advertising. It was common to see ST ads mentioning the travel time from Everett to downtown Seattle. I don’t think I saw an ad comparing the actual ST3 improvement (the travel time by bus from Everett to Lynnwood compared to the time taken by train). That isn’t the only improvement, of course, but the point is, it was deceptive to imply that ST3 was building Lynnwood Link, while instead they were building Lynnwood to Everett light rail. As it turns out, the ads weren’t deceptive in that way. ST3 money really is building Lynnwood Link, it is just that they will likely fall short for getting to Everett. Of course, things can change. The project is so large and takes such a long time, that things could get better. Snohomish County could become huge (maybe Amazon will put their second headquarters there). The feds could give us a lot of money (that actually seems more likely). Hard to say, but I think ST3 money used to complete Lynnwood Link is appropriate (hard to see anyone objecting to that, while they have every right to complain about the lack of transparency). With Tacoma it isn’t that clear. Does Tacoma get anything out of Link going further south (but short of Tacoma)? I don’t see that at all. It could go all the way to Fife and folks would still use the express buses to downtown and Sounder. One (fairly weak) argument for Tacoma Dome Link is that it would make going to the airport easier, but again I don’t see a transfer in Fife (or Federal Way) making that any more appealing. and there are few general areas outside of First Hill that the region will want to fund as a high priority. Oh, I wouldn’t say that. I think Seattle would love to fund a Ballard to UW subway. Much of the planning has already been done. The UW and Ballard are both growing substantially, as are areas along the Link corridor (e. g. Northgate is poised to be a significant employment center). The problem is what to add in the other regions. You could simply add what we approved last time, but that would be extremely unpopular (although they did that before). It is one thing to expect people to forget where the southern end of ST2 was supposed to be (240th, 320th?). It is another thing to ignore something they have been talking about for years, and finally passed (a spine from Everett to Tacoma). I think ST would have trouble passing a regional proposal for that very reason (although it didn’t stop them before). I guess if they fire the CEO (blame him) restructure the board, promise to do better next time maybe that will happen. There are a few cost effective projects, though, that I could see being popular. A busway from SR 520 to UW station would be great. Imagine a bus getting off 520 (in the HOV 3 lane) and not stopping until it was in the parking lot east of the station. That area becomes a transit center, effectively (although only from 520 buses). That is expensive, but would be quite popular from folks on the east side (and nowhere near as expensive as running rail all the way across the lake again). North and south is where it is a challenge. If Link gets to Lynnwood or better yet, Ash Way, it is hard to see folks willing to spend even more money to get it to Everett. I’m sure there are lots of little projects in both Pierce and Snohomish County that would be more cost effective than extending Link — the question is whether ST can figure out what they are. My guess is we are done — that ST3 was it, as the region itself will be tired of spending money on this thing. The south end is already voting against it, and if Snohomish turns, then it will be hard for Seattle to pick up the slack. That would mean that Seattle (and perhaps Bellevue) would need to have the rights to fund a big project on their own. I don’t have such a rosy hopefulness for a Ballard-UW subway. The ST3 SLU-Downtown subway is already a major engineering and cost challenge that will make all of the other extensions look like small potatoes; long tunnels won’t be so attractive after that upcoming cost and construction ordeal. The terrain near 45th varies significantly — From Phinney Ridge to the I-5 trench. Fremont is very quaint but isn’t profoundly developed beyond many other parts of Seattle and there isn’t a regional draw there except for some tech offices. Wallingford is even less dense and doesn’t have any major regional draws. Finally, there are no station options facing east in Ballard — and any subway or high bridge option will be a major restriction for an eastward extension. A new line would need a maintenance facility in the corridor and I don’t see that being easy either. The most likely undiscussed issue that I expect about northern Seattle is the overcrowding issue. It will be hard for riders to get on morning trains south of Northgate once Lynnwood opens — and harder as the terminus moves north. In that case, it will probably be back to the concept board to examine what’s the best way to extend the line north of Ballard and ease overcrowding, and the resulting solution would seem to be a more northern corridor. Overall I concur with this sentiment. I hate to beat a dead horse, but I do have to remind folks that the 2007 version of ST2 (the transit portion, that failed at the polls) included running light rail to Ash Way. The decision to shorten the line in the subsequent iteration (that did pass at the polls in 2008) to end at the Lynnwood TC was a particularly short-sighted one and a big missed opportunity for this corridor in the second phase of extensions. Limecycle in Tacoma: rental scooters on the waterfront that aren’t conducive to functional use, as the only public transit is a single cut-through bus route. Recreational only. Drive to the waterfront and scooter around for fun??? Pure stupidity. I’ve been walking that waterfront for years. I swear, if some jerk on a scooter cuts in front of me, he’s getting knocked off the scooter. Limecycle can go away unless they can demonstrate a functional use. They’re already blocking sidewalks in Old Town. Put them downtown and near the T Dome, where they might actually serve a public benefit. Nothing wins friends and influences people like assault! Ron, a little hyperbole never hurt either. It’s certainly been a frustrating week, as I’ve seen Limecycles strewn everywhere. On a bench. In the middle of multiple sidewalks. Thrown in the lawn. Here’s my follow up question. Is it legal for me to put a GPS and locking mechanism on my own personal bicycle, and then park it in the middle of a sidewalk or in the lawn area of a public park? Thanks for the update on this case, State of Oregon v. Valderrama. I had read about the case a little while ago but didn’t know it had concluded. You can read the court’s short 6-page opinion using the link contained in the ACLU of Oregon page I’ve linked to below. It’s pretty straightforward as the plaintiff represented here did not satisfy the four conditions necessary for a lawful administrative search. Thus the defendant’s motion to suppress was granted by the court. The state apparently has not yet said whether it will appeal the ruling, and I’m not sure on what grounds they would actually file their appeal anyway. This case reminded me of a case here in Washington from several years ago that was ultimately reversed at the state’s Supreme Court that also centered on a transit rider and a fare enforcement officer, Washington v. K.L.B, a minor. The circumstances were different but the cases share a common element as to the authority of fare enforcement officers to detain and search a transit rider. In case you’re interested in reading about the Washington case, I’ve included a link to the WSC’s opinion below as well.